CellarThief: Great Wines! Stellar Prices! Wine Deals! FREE SHIPPING* on 6 bottles. Send me Wine Deals by Email! Get notified of CellarThief wines by email for FREE! 93 WE | "Excellent Cool-Climate!" 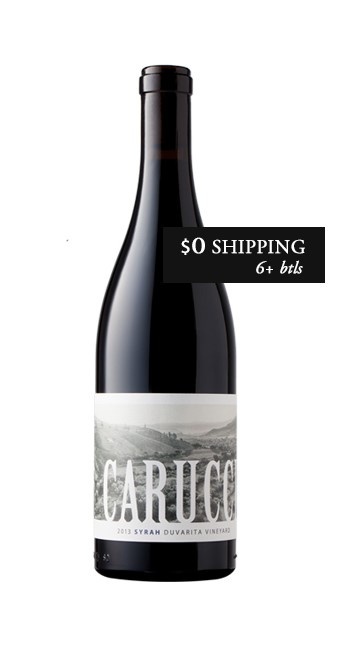 When it comes to Californian Syrah, we’re definitely on the cool-climate train, and the 2013 Carucci Syrah is about as cool-climate as it gets. The Duvarita Vineyard lies just outside the boundary of the Sta. Rita Hills on the Western edge, placing it in close proximity to the ocean and making it even cooler and windier than any other vineyard in Santa Barbara County’s premier AVA. Additionally, the Duvarita vineyard is an entirely biodynamic affair, with farming taking place on a more holistic and interconnected level with the environment. That’s where the husband and wife winemaking team of Carucci Wines comes in: they’ve always had a knack for discovering incredible and unique vineyards and exemplifying them . . . in the form of an exceptional bottle of wine that showcases their unique character, their subtle perfections and imperfections. So of course, Duvarita jumped out at them for its singularities. The Syrah is not only one of the most unique produced in Santa Barbara County, it’s also distinctly Old World-style, in spite of its cooler climate: instead of receiving warmth from the sun, the grapes got it from the soil itself, which also imparted an underlying minerality that screams Cote du Rhone on the palate. The Carucci’s let Mother Nature wear the pants in this relationship: “the growing season will always dictate the decisions we make in the cellar.” Turns out that 2013 was the second year of near-ideal growing conditions throughout the state, which only made the Syrah more expressive of the potential that Duvarita has to offer. The Carucci 2013 Duvarita Vineyard Syrah shows great richness, depth and balance with expressive notes of elderberry, cracked black pepper, and bay leaf, with a touch of oak and lavender rosemary on the finish. Located between the towns of Buelton and Lompoc in the northwestern part of the county, Sta. Rita Hills lies closer to the equator than any European wine region. The valley’s unique east-west orientation is the key to success with this cool climate variety. Pair this with a rich tomato based pasta dish or with a lighter red meat dinner. "This is a cool-climate expression of Syrah from a biodynamically farmed vineyard west of the Sta. Rita Hills. The nose shows extreme tar, beef char, cracked black pepper and bay leaf, with gamy undertones. The tightly wound palate combines dusty elderberry with charcoal, more pepper and a lavender-rosemary flash on the finish". Wines from the Paso Robles and Central Coast areas show many different faces. Some of them are big, bold fruit bombs, and others are elegant, terroir-driven stunners. Carucci's Syrah falls into the latter category, with an Old World-esque pallet. It seems to have evolved and gotten even better from September's Enthusiast review, and I was sure to buy up all that there was. It's a wine that will please lovers of either side of the pond. Tell your friends about cellarthief and earn $20 of cellarthief credits. 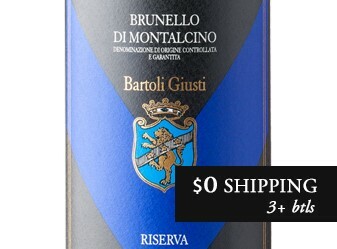 I know you love great wine and great deals as much as I do! Check out cellarthief, the ultimate source for the best wine deals, anywhere. Access is for Members only; it's free and simple to sign up! Here's your private invitation for this wine experience. Invite a Friend is not available to members of the same household. You will still be able to send an invite, but no credits will be applied to your cart. Warm weather should not deter you from accessing great wines at exceptional values. For this reason, we're again offering our Members the most innovative and progressive warm weather shipping program. Features that ensure every bottle is handled with impeccable care; from our temperature controlled warehouse, leading-edge packaging and refrigerated trucking solutions, the end result is wine delivered in pristine condition; all with our palate guarantee. To enjoy our Warm-Weather Shipping Guarantee, simply select the default delivery option at check-out and leave the rest to us. The invino team will supply special packaging to allow temperature control during shipping; however, there is a small surcharge for the cost of this service. You may select any shipment method; however, without use of the special packaging service, we can’t guarantee perfectly delivered wines and void any warranties for claims of damage. All orders are sent to minimize transit time, and though we will continue to pack all shipments as quickly as possible, it may be that a shipment will be held until the next available delivery window (and safely stored in our refrigerated warehouse until the wines begin their journey to your door). Packages for your location will leave the invino warehouse Monday-Thursday each week. ESSENTIAL: Someone over the age of 21 MUST be able to sign for the shipment on the FIRST DELIVERY ATTEMPT to ensure pristine condition of the wine. If you can't be available, contact Member Services or the carrier and make alternate delivery arrangements. Unfortunately, if the first delivery attempt is not successful, invino bears no responsibility for the condition of the shipment – but our primary goal is to deliver your wine in perfect condition from our headquarters to your door. Packages for your location will leave the invino warehouse Monday, Tuesday and Wednesday each week. Packages for your location will leave the invino warehouse Monday and Tuesday each week. Packages for your location will leave the invino warehouse each Monday. Also avaialable for an addtional small fee is the FedEx refrigerated shipping option (choose refrigerated shipping).All orders are picked up by FedEx each week on Friday in a refrigerated truck for arrival at your location the following Tuesday or Wednesday before 10:30 AM. Your wine will remain in a temperature controlled environment up until the morning of delivery. While we strive to pack all shipments as quickly as possible, it is possible that your shipment may be delayed to the next available shipping window. The invino team will guarantee safe delivery by shipping the wine FedEx refrigerated ground service; however, there is a small surcharge for the cost of this service. You may select any shipment method; however, without use of the special service, we can’t guarantee perfectly delivered wines and void any warranties for claims of damage. Please note that we do our very best to get shipments out each week, but only ship once per week (on Thursday) for arrival into our east coast facility. Orders must be submitted before Sunday midnight Pacific Standard Time to be eligible for shipping out the following Thursday. Orders that don’t make the cut-off will remain safely in our temperature-controlled warehouse until the following week. All refrigerated ground orders will be delivered the following Tuesday with your wine safely stored in a temperature controlled environment until the morning of delivery. ESSENTIAL: Someone over the age of 21 MUST be able to sign for the shipment on the FIRST DELIVERY ATTEMPT to ensure pristine condition of the wine. If you can't be available, contact FedEx and make alternate delivery arrangements. FedEx will hold you wine for up to 5 days free of charge at any FedEx Kinko's location. Unfortunately, if the first delivery attempt is not successful, invino bears no responsibility for the condition of the shipment – but our primary goal is to deliver your wine in perfect condition from our headquarters to your door. Warm weather is not something that should deter you from accessing great wines at exceptional values. For this reason, we're again offering our Members the most innovative and progressive warm weather shipping program. Features that ensure every bottle is handled with impeccable care; from our temperature controlled warehouse, leading-edge packaging and refrigerated trucking solutions, the end result is wine delivered in pristine condition; all with our palate guarantee. The invino team will guarantee safe delivery by shipping the wine to our temperature controlled east coast distribution center in a refrigerated truck; however, there is a small surcharge for the cost of this service. Please note that we do our very best to get shipments out each week, but only ship once per week (on Tuesday) for arrival into our east coast facility. Orders must be submitted before Sunday midnight Pacific Standard Time to be eligible for shipping out the following Wednesday. Orders that don’t make the cut-off will remain safely in our temperature-controlled warehouse until the following week. Refrigerated ground orders will be delivered the following Tuesday or Wednesday with your wine safely stored in a temperature controlled environment until the morning of delivery. During summer months, we employ 'zone skipping'. We ship your wine via a refrigerated truck to our east coast fulfillment partner who then adds ice packs and ships to the final destination via common carrier. This allows us move your shipment safely during warm weather. There is a surcharge that covers a small portion of the additional cost of this service. You may choose any shipment method you like, but we strongly encourage the use of this special service. Wines leave weekly (on Thursday) via refrigerated truck for delivery the following week. Also avaialable for an additional fee is the FedEx refrigerated shipping option (choose fedex refrigerated shipping). All orders are picked up by FedEx each week on Friday in a refrigerated truck for arrival at your location the following Tuesday or Wednesday before 10:30 AM. Your wine will remain in a temperature controlled environment up until the morning of delivery. While we strive to pack all shipments as quickly as possible, it is possible that your shipment may be delayed to the next available shipping window. This service is much more expensive than our zone skip service, but the wine will arrive to you much more rapidly. IT IS ESSENTIAL THAT SOMEONE OVER THE AGE OF 21 IS ABLE TO SIGN FOR THE SHIPMENT ON THE FIRST ATTEMPT OF DELIVERY. INVINO BEARS NO RESPONSIBILITY FOR THE CONDITION OF THE SHIPMENT IF THE FIRST DELIVERY ATTEMPT IS NOT MADE. WE STRONGLY RECOMMEND SHIPPING TO A BUSINESS ADDRESS TO ENSURE SAFE DELIVERY. I have read and agree to the terms of the refrigerated shipping program, please process my order.